WhatsApp is reaching new heights with the announcement that users can use their web browsers to use their services and the launch of a new SIM card WhatSim by Zeromobile. These innovations will surely enhance the usability of WhatsApp and definitely help people stay connected. 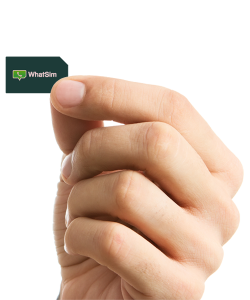 WhatSim is a new SIM card from Zeromobile that is custom built for chatting! Using a WhatSim card you can chat on WhatsApp free of cost. This will be a huge advantage for WhatsApp users because connectivity no longer depends on Wi-Fi. WhatSim users can keep chatting on WhatsApp no matter where they go because it connects to more than 400 mobile operators in 150 countries. WhatSim connects to the operator whose signal has the highest strength automatically and switches to a better mobile operator when the strength expires. The best thing about WhatSim is that you need not pay any charges for chatting. You just need to purchase a WhatSim for €10 and enjoy WhatsApp for a year. You may continue using the service after a recharge of €10 only. WhatSim charges for multimedia transfer, though. The charges are not unique but depend on your location. The countries where WhatSim service is available are divided into four zones and each zone has different rates. WhatSim uses a credit system to implement this. Each recharge of €1 earns you 200 credits. You can use your credits to send multimedia messages according to the charges applicable to your zone. You can purchase WhatSim by placing an order on the official website. You can also find out the credits for multimedia messages on your zone. Now you can access WhatsApp from your web browser. To avail this service you need to visit here (opens in new tab) in your Google Chrome browser where you will see a QR code. Open WhatsApp on your phone and scan this QR code from it. This pairs your phone with WhatsApp web client and lets you access WhatsApp from your web browser. To make this work your phone needs to have internet connectivity. WhatsApp web is currently not available for iOS devices.